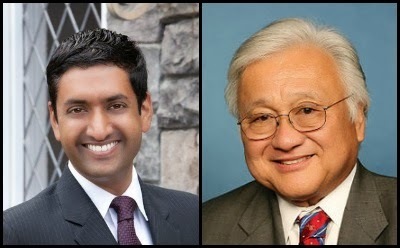 CONGRESS | 17TH DISTRICT | In a three-way race for the 17th Congressional District, Rep. Mike Honda holds a double-digit lead in both the June primary and head-to-head matchups in November against fellow Democrat Ro Khanna and Republican Vanila Singh. The poll, conducted Feb. 13-16 by Public Policy Polling, was commissioned by Democracy for America, which endorsed Honda last year. The results not only show Honda in firm control of the race with under 100 days until the top two June primary, but also reveals the potential disruption the conservative Singh, a South Bay physician who entered the race last December, may pose for Khanna. Both are of Indian descent in one of the largest Indo American regions in the country. When party affiliation is attached to each candidate, Honda received 45 percent of the poll, followed by Singh at 29 percent and Khanna at 26 percent. However, when the affiliation is removed, Honda’s support rises to 62 percent while Singh’s drops precipitously to 11 percent. Khanna, meanwhile, remains virtually constant at 27 percent, according to the poll. Both poll questions, however, include a relatively high margin of error at 6 percent. Head-to-head general election matchups also favor Honda, according to the poll, which this time, feature a much larger sample of the district’s voter and a margin of error of 4.4 percent. In a November race between Honda and Khanna, Honda leads 61-39 percent. Honda also leads a bipartisan race against Singh, 69-31 percent. Similarly, Honda’s approval/disapproval numbers polled at 61-31 percent, with 8 percent without an opinion. Posted in 2014 Election, CA17, congress, June primary, jungle primary, Mike Honda, November election, polling, Ro Khanna, Vanila Singh. Bookmark the permalink. The one thing this makes clear to me is that most of Ro's supporters are Republicans/Libertarians who would not vote for Honda no matter what. A shame. Ro should really have run against Swalwell. Hmm, but in the June primary of 2012, Stark got 42%. Stark at 42% and Honda at 45% and some folks think Honda is sitting pretty? In head to head matches Honda tops 60% which means they will have a hard time beating him. I think Ro is very disappointed in the poll. Where does Ro run next? I'd support him if he moves to a republican district. Ro for Congress in a republican district in 2016! I'm not sure about Swalwell, but I'm very sure about Honda. I hear Ro's already hired a real estate agent. Moving after he loses in June. How can someone represent a group of voters in a Cong. district when that person has not even lived in that district and probably still does not live there. Dr. Singh's bio says that she was born and raised in Fremont and that she has been living in the Bay Area. Hence is expected to be familiar with the local issues and the history of their evolution. She coming a second in the poll is no surprise. Khanna ran against Lantos and was unsuccessful. Then he moved across the Bay and contemplated running for Stark's seat after he retired. After he saw Swalwel beat Stark, he turned his sights to another district. I don't know why he chickened out in challenging Swalwel. Good luck in trying to identify the next vulnerable target after he loses in June. Neither Singh or Ro can beat Honda. But surely they will have some leftover campaign signs in November that they can handover to their kids and grandkids.